When you first register or log into a new Crowdicity community you will be taken through a 'Profile wizard', a pop up box that asks you for personal information such as your name and location. Crowdicity community owners can add questions to this profile pop-up box, so you may also be asked questions relevant to your community, for example your age or the kind of work that you do. The information that you enter when you register in a community makes up your profile, you can view and change your profile at any time. 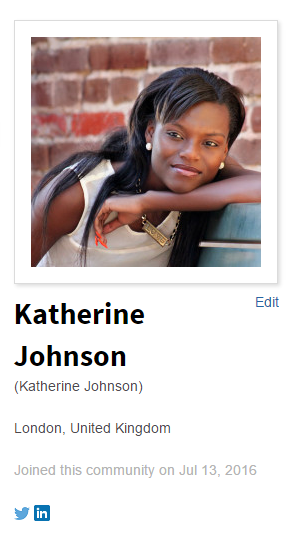 Click on your user picture (or the blank user icon) that is at the right of the navigation menu. This will open a box that gives you an overview of your profile and some options e.g. Go to your messages, go to your profile,etc. Click on Go to profile to open your profile page. From here you can view and edit the information related to your profile. Underneath your user picture, you will see a link that says Edit. 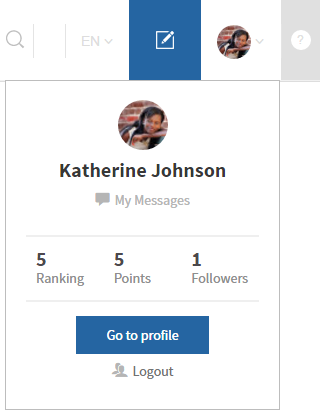 When you click this link, you will be able to edit the different fields in your profile, and to change your user picture. To save any changes that you make, scroll to the bottom of your profile information and click Save. Follow the steps above to open the option s to Edit your profile. Click on the button that says Upload or change picture underneath your current profile picture (this box will be blank if you don't currently have a picture). 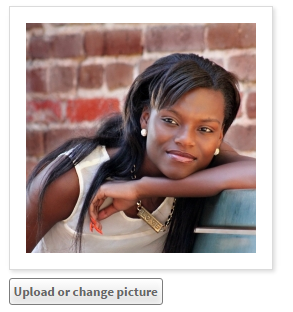 A window will open that allows you to choose or upload a file for your profile picture. You can select an image that you have already uploaded, or you can upload a new image. If you want to upload a new image, click ' Choose File', browse your computer for the image you'd like to use, select it and then click 'Upload file'. When the file has uploaded click the Save choice button, this will close the file upload window. Click Save at the bottom of the profile fields to save any changes you have made. 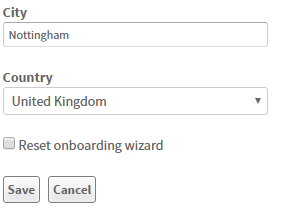 If you'd like to reset all of your profile fields, you can reset the 'Onboarding wizard'. The onboarding wizard is the grey pop-up window that appears when you first log into a community, it's the area where you are asked things like your location, timezone, and any additional questions that are specific to the community. Go to your profile area and click Edit, under your profile picture. Select the tick box and click save. When you return to the community, you will be asked to complete the onboarding wizard again, allowing you to give different answers if you'd like.